Wichita and Greeley counties lie within the High Plains section of the Great Plains physiographic province. The area consists of flat to gently rolling upland plains that are dissected in several areas by shallow valleys. The plains surface slopes gently eastward at the rate of about 15 feet to the mile from about 3,900 feet near the Colorado border to less than 3,100 feet at several places on the Wichita-Scott county line. Plate 3B--Valley of White Woman Creek looking south, SE sec. 22, T. 18 S., R. 38 W., Wichita County. 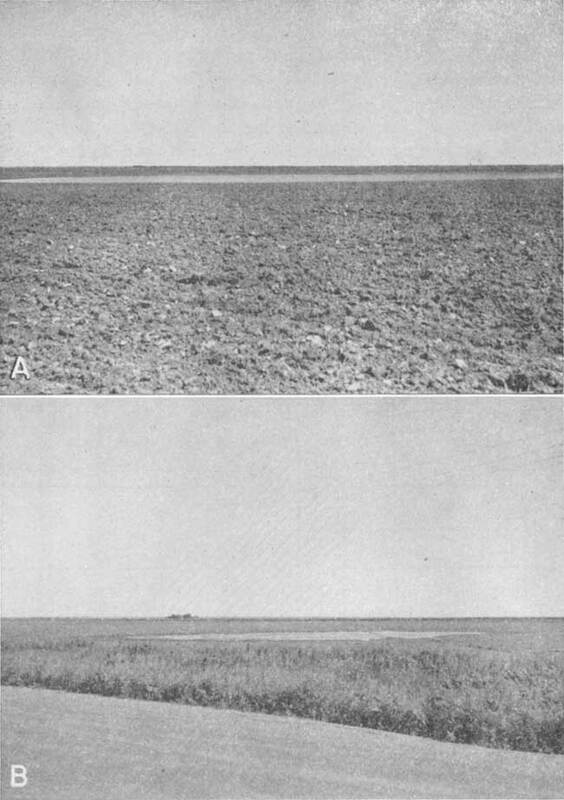 Beds of the Ogallala formation crop out at left. Wichita and Greeley counties are crossed by Ladder (sometimes called Beaver) and White Woman Creeks. 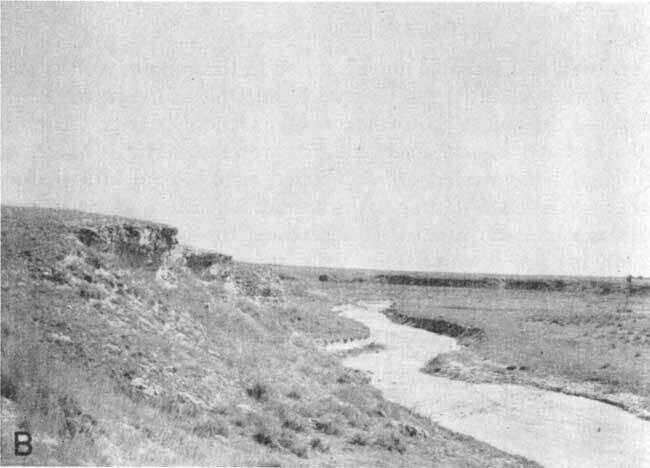 Ladder Creek enters from Wallace County and flows eastward near the northern border of Greeley County to the Wichita County line, where it turns and flows southeastward for several miles, Midway across Wichita County, Ladder Creek again flows in a general easterly direction until it reaches a point in Scott County a few miles northwest of Scott City. It then flows northward, joining Smoky Hill River in Logan County. White Woman Creek (Pl. 3B) rises in eastern Colorado, flows southeastward across Greeley and Wichita counties into Scott County, and about 4 miles cast of the Scott County line turns northeast, flowing into the Scott Basin, a large depressional area southeast of Scott City. Sand Creek, which rises in southwest Wichita County, parallels White Woman Creek across southern Wichita County, joining White Woman just east of the Scott County line. With the exception of Ladder Creek downstream from sec. 22, T. 17 S., R. 37 W., where springs provide water for a permanent flow, all streams in Wichita and Greeley counties are intermittent. They contain flowing water only during and after heavy rains. Common features of the upland plains in this area are shallow undrained depressions, which range from a few tens of feet to about half a mile in diameter (Pl. 4). After heavy rains many of these depressions become temporary ponds and some of the larger depressions, such as Dead Horse Lake in southwestern Greeley County, contain water for many weeks or months after rains. Plate 4--Undrained upland depressions. A, Undrained upland depression in plowed field in the SE sec. 6, T. 18 S., R. 37 W., Wichita County. View is to he north. B, Undrained upland depression in pasture in the SE sec. 18, T. 18 S., R. 35 W., Wichita County. View is to the northwest. The climate of Wichita and Greeley counties is semiarid and is characterized by abundant sunshine, moderate precipitation, good wind movement, a high rate of evaporation, and low humidity. The summer beat is relieved to some extent by the low humidity and wind movement. The diurnal range in temperature is high and although the summer days are hot, the nights are generally cool. As a rule the winters are moderate, there being only occasional short periods of severe cold weather and relatively little snowfall. The amount of precipitation and its seasonal distribution are the chief limiting factors in crop growth. According to records of the U. S. Weather Bureau, approximately 77 to 78 percent of the annual precipitation falls in the 6 months from April through September when the growing season is at its height and moisture is needed. The normal monthly precipitation during the period of record at Tribune is shown in Figure 3. Fig. 3--Graph showing normal monthly precipitation at Tribune. The normal annual precipitation at Leoti, in Wichita County, is 17.31 inches and at Tribune, in Greeley County 16.42 inches. The range at Leoti has been from a minimum of an estimated 7.80 inches in 1911 to a maximum of 29.48 inches in 1923. The range at Tribune has been from a minimum of 7.76 inches in 1934 to a maximum of 33.39 inches in 1915. Figures 4 and 5 show the annual precipitation and the cumulative departure from normal precipitation at Leoti and Tribune, respectively. Fig. 4--Graphs showing annual precipitation and cumulative departure from normal precipitation at Leoti. Fig. 5--Graphs showing annual precipitation and cumulative departure from normal precipitation at Tribune. The normal annual temperature in the area is about 52.5°F. The lowest temperature on record in the area was -26°F. on January 12, 1912, at Leoti and the highest temperature on record was 111°F., which was first recorded at Leoti on July 13, 1934. The average length of the growing season is 162 days, the seasonal period ranging from 129 to 191 days in Wichita County and from 123 to 189 days in Greeley County. The population of Wichita and Greeley counties increased from 2,884 in 1920 to 4,291 in 1930. However, the extended drought during the next decade resulted in a decrease to 3,823 in 1940. According to the Federal census of 1950, the population total for the area had increased again to 4,650, that of Wichita County being 2,640 and that of Greeley County, 2,010. [Note: In 2000 U.S. Census, Wichita County population was 2,531 and Greeley County was 1,534 (KU Institute for Policy & Social Research).] The population of Leoti rose from 392 in 1920 to 1,250 in 1950 [1,598 in 2000].The population of Tribune rose from 243 in 1920 to 1,010 in 1950 [835 in 2000]. Horace had 212 inhabitants in 1920 and 258 in 1950 [143 in 2000]. Among the 105 counties in Kansas, Wichita County ranks 100th [98th in 2000] and Greeley County 105th [105th in 2000] in population. Wichita and Greeley counties are served by the main line of the Missouri Pacific Railway Company, which crosses from east to west through Leoti and Tribune. The principal hard-surfaced highway is Kansas Highway 96, which runs from east to west through the center of the area parallel to the railroad. Kansas Highway 27 extends from north to south across Greeley County, passing through Tribune. Kansas Highway 25 crosses Wichita County from north to south. From Leoti north to the Logan County line this highway is gravel-surfaced. Wichita and Greeley counties are fairly well covered by improved section-line roads, except the southwestern part of Greeley County, which is sparsely populated and has few improved roads. Agriculture is the dominant economic activity in Wichita and Greeley counties; wheat is by far the most important crop. Other Major crops include sorghums and barley (Table 1). The acreage of land irrigated has increased rapidly during the past decade. In 1951 approximately 11,000 to 12,000 acres, mainly in Wichita County, were under irrigation; the chief crops irrigated were sorghums and sugar beets. Wichita and Greeley counties have a total land area of about 964,48O acres, virtually all the land being in farms. According to a census conducted by the State Board of Agriculture, there were 110 farms in Greeley County [300 in 2005] and 297 farms in Wichita County in 1946 [330 in 2005]. Placed on web Jan. 11, 2008; originally published April, 1954.